As the table illustrated, the so called “trump rally” is the weakest among the previous two weekly cycles. The most bullish weekly cycle is the cycle coming out of the longer term four-year cycle. As we are getting closer to the one-year mark of the four-year cycle, we are anticipating a correction that will correct the cumulative advance since February 2016. That will lead to a seasonal low in the first quarter, most likely in February/March time frame. Based on the percentage decrease of the subsequent cycle strength, we project this weekly cycle high to be 2280-2300. The pending correction either falls on the first channel line or the second channel line. 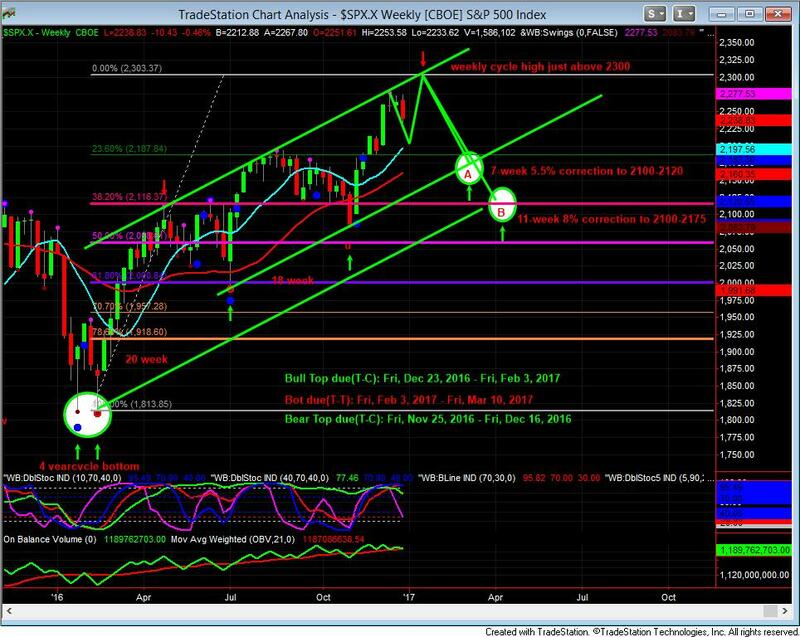 The projected correction is either 7-week 5.5% decrease to 2100-2120 or 11-week 8% correction to 2100-2175. The correction is imminent. The most likely time frame is immediately after the inauguration. Smart money has already left the market before the ceremony. Keep your powder dry and reload during the seasonal low in February/March 2017.